Sameep Padora of sp+a interacts with the students. 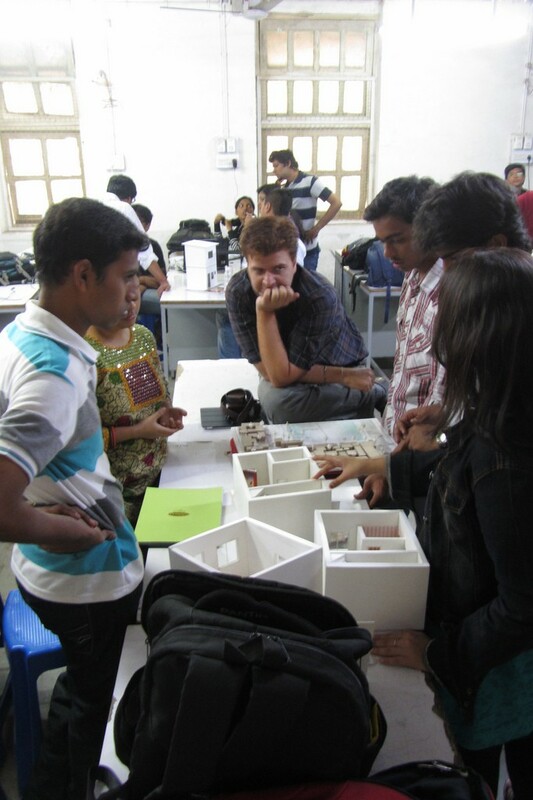 Marco Ferrario of Micro Homes Solutions (New Delhi) with some of the students. 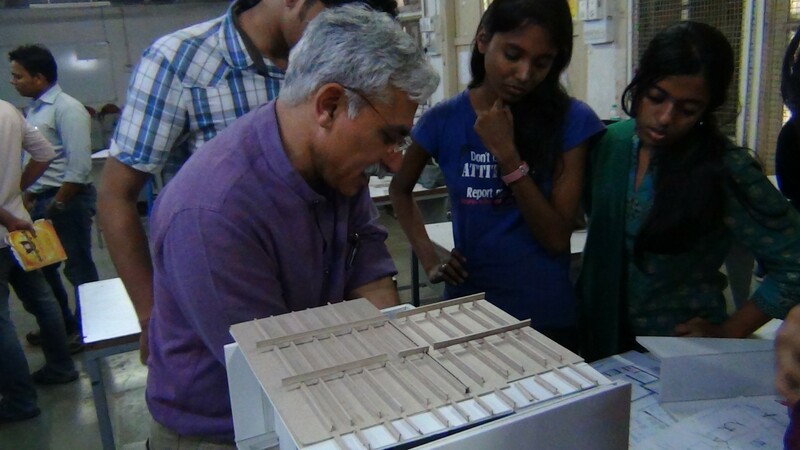 Rajeev Kathpalia of the Vastu Shipla Foundation in Ahmadabad looking at students’ project. 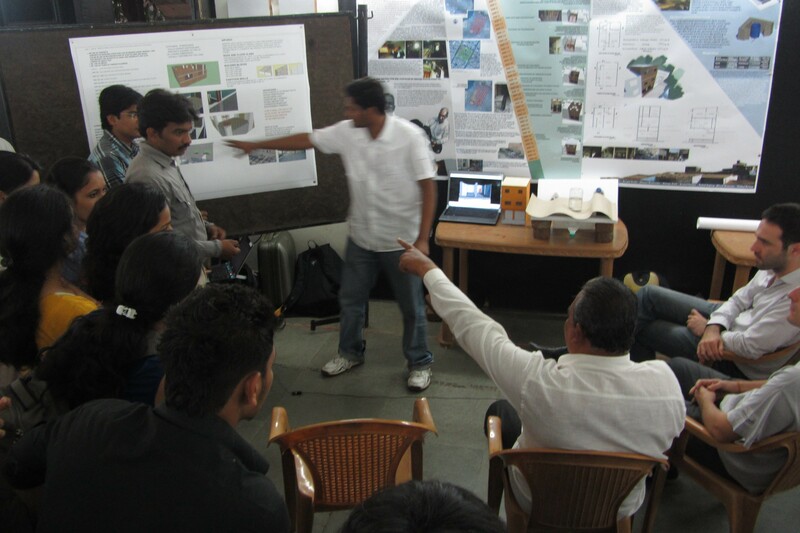 JURY: Contractor Syyed Mohammed Gous (Chand Bhai) responding to the students’ proposals. Contractor Pankaj Gupta discussing construction techniques with students. 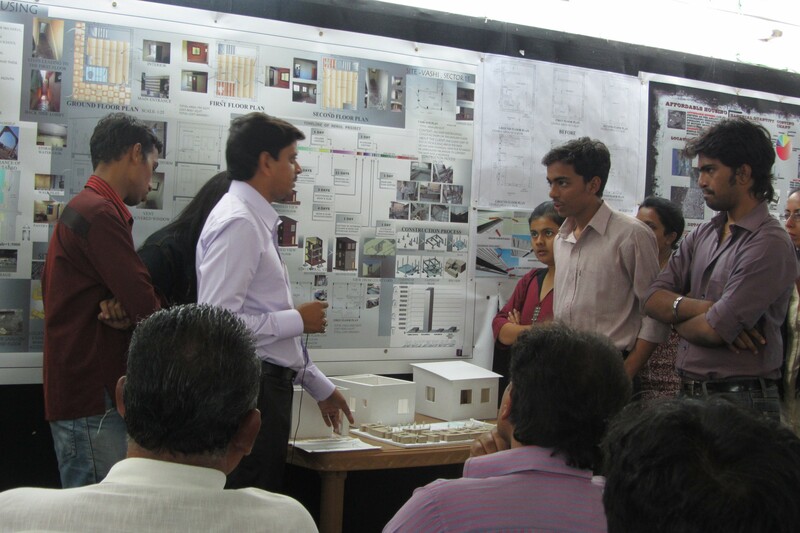 The 3-day long affordable housing workshop was conducted at the J.J. College of Architecture, Mumbai, on January 23rd, 24th and 25th, 2012. It was a follow- up from 6 weeks of 9 groups of students documenting the work and processes of a contractor’s building methodology and construction techniques. This included a timeline tracking the life of the structures studied and activities that revolve around them. The sites they frequented were sprinkled all over the city – Shivaji Nagar, Nerul, Vashi, Bhandup, Charkop and Dharavi. The 4th year students participating in the workshop, along with being guided by their teachers Profs. Mustansir Dalvi and Yashwant Pitkar and Matias Echanove and Rahul Srivastava, had an array of resource people, each with their specific set of specializations, to help them out with different aspects of the design. This design was basically an insertion or mutation within the existing typology which was to emerge/evolve during the course of the workshop, through exchange of information with the resource people. These were Sameep Padora, Founder of sP+a, Mumbai; Marco Ferrario, co-founder of MicroHome Solutions, New Delhi; Poonam Mulchandani, independent architect, Auroville; Alexis de Dulca, head of Affordable Housing at Lafarge, Chennai; Rajeev Kathpalia from the Vastu Shilpa Foundation, Ahmedabad; Thomas Demschner, senior structural engineer at Lafarge, Lyon and Ritu Mohanty, urban designer at Edifice, Mumbai. Day 1 was a day of orientation and introduction. Prof. Dalvi brought the freshly arrived resource people up to date with the events of the weeks gone by. He spoke about the seminar and workshop having which covered issues of housing in the city in a counter-intuitive manner unusual for the design curriculum in place. It stood beyond the realm of real estate and affordable housing envisioned by the state. Since most of this was built directly or indirectly by the users themselves, it was worth recognizing as an alternative explored in this studio. He proceeded with explaining the methodology adopted for the studio and its objective so far. This included re-looking at the houses documented and proposing changes to the contractors, who would be invited on the final day. These could be functional, aesthetic, procedural and much more and would be produced on the basis of the information and knowledge absorbed from the interactions with the contractor and the subsequent lessons inferred from the site visits added to the inputs from the resource people. Rahul and Matias spoke about the kind of approach they had tried to inculcate right through the workshop. According to them, practice and the production of knowledge is connected. But there exists a hierarchy in knowledge production. The point is to subvert this hierarchy and invert the notions regarding who really is the expert. Therefore, the students would absorb knowledge from the contractors, in turn passing on this new acquisition to the resource people who would reflect ideas from these existing circumstances. They spoke about how the sites in question could not so easily be described as’ slums’. Urban practitioners and planners cannot work with certain terms and this was one of them. Thus, new terminology needs to be generated to define this phenomenon. Just like hundreds of different typologies cannot merely be grouped into being ‘suburban’. This understanding led to their insistence that students reconstruct existing narratives of these sites and look at them in a dynamic way-not just as they currently exist, not just purely as structures, but also the process through which they are built, on the basis of a timeline. The ‘field’ in fact, becomes the centre of the whole pedagogical process. To engage, instead of to observe is necessary. The space informs and the student listens and in the future, shares. This entire study would most importantly, involve forging a deep sense of connection with the place and the contractor. This relationship would be strengthened through mutual sharing where one would constantly learn from the other. Also, the student would try and address where the entry point for an architect would be in this situation. The role of the student would also be to take a lead in interactions with the resource people and sustain a dialogue. This would be an important subversion which would eventually dissolve the expert-non expert dynamics. Then the output will not remain purely academic and will be one that can be executed successfully on site.. The resource persons then took turns to introduce themselves and their work so the students could get an idea of what kind of questions they could bombard each one with. The students then proceeded to explain, a group at a time, the sites, the documentation, introduce the contractors they had collaborated with, elaborate on the timeline, investigate into structure, materiality and costs with diagrams, technical drawings and physical models. The discussions were punctuated with small question and answer sessions till everyone was familiar with each site, the houses, the families, the contractors and the workers involved. Here are a few panels on display. After a short break the entire assemblage moved to the studio space where one on one interaction ensued and ideas were thrown back and forth. These were discussions about what could now be contributed by students for a better design once the process and structure was analyzed more deeply. To be kept in mind at all times was the context, the practicality and the ability to communicate these ideas to the contractor at the end of the workshop. This was carried over to the next day. Day 2 had more resource people joining in as the exchange continued and students started generating models and drawings for their insertions while consulting the relevant sources of information. There was a small lecture by Alexis, Thomas and Jean-Michel on the efficient use of ready-mix concrete while Poonam provided an alternative viewpoint involving use of locally available material and appropriate technologies with low environmental impact. The students spent the beginning of the day absorbing from as many people as possible and the rest of it, processing this new-found data and applying to their respective subjects. Day 3 was the final day when all the discussions of the previous days culminated into a set of breakthroughs on each group’s desk. This meant last minute consultations to allow for clear articulation because the day was to end at a special moment, when the contractors viewed the work of the students and critiqued their design suggestions.Contractors Pankaj Gupta, Syyed Mohammed Gous (Chand bhai) and Anwar ji arrived right on time and were taken around by the enthusiastic students. They looked slightly amused at the painstakingly detailed documentation of their self built houses and site, as well as that of the other contractors. One by one each project was discussed, though the focus was on the student’s new input. The contractors carefully listened and then countered the arguments with reasons why these would or would not work on site, taking all aspects of the existing situation into consideration. There followed a vibrant exchange with inserts and rebuttals from all the actors- the students, the contractors and the resource persons which continued well into the evening. Design suggestions varied from changes in materials to consistency to light, ventilation and circulation. Some were well received and some debated, eventually leading to everyone in the room having participated, reacted and resolved the issue in some capacity or the other.